Our development and services offer customized and specific solutions to each client and their needs by Joomla platform (CMS) and e-commerce with Virtuemart (online store). Our consulting services implement a global web solution (from domain & hosting untiladministration & support), including migration from previous versions with Joomla 1.5 and VirtueMart 1.1 to current versions, debug errors, root cause analysis and propose alternative solutions. Improvements of SEO, both web and shop online. Apply security policies to several levels. In our model we are the administrator of your web site and give support during all days of year. All our projects have training about Internet, Joomla, Virtuemart and Security to the end customers. We offer flexibility to adapt and improve your current situation to final solution with VirtueMart. VirtueMart 2 - The Joomla shop! is another book written in german, by Götz Nemeth. Götz Nemeth works as an IT manager and organizer of an online shop. He is also a freelance IT trainer, e-marketing developer and author. Store systems are his specialty. His love of literature and his ability to explain complicated matters in a simple way, led to his decision to write it yourself. Specialist in e-commerce specialist, Goetz Nemeth in this book shows how to set up your shop with VirtueMart, adjust products and related information, edit the data store to provide payment options and more. He also demonstrates how you can combine the shop with the free enterprise resource planning solution JTL WaWi. 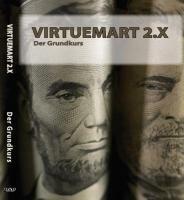 A video-tutorial for VirtueMart2.x (german language). In diesem Videotutorial lernen Sie, wie Sie einen vollständigen LAMP-Server aufsetzen, das Online-Shopsystem VirtueMart zusammen mit Joomla grundlegend konfigurieren, die Lokalisation von VirtueMart durchführen, Produkte in Ihren Shop einpflegen, Versand- und Zahlungsarten einrichten, ein E-Mail-System zur automatischen Kundenkommunikation einrichten, Lieferscheine und Rechnungen automatisch erstellen lassen, Steuern und Preisangaben konfigurieren, die Shop-Oberfläche ansprechend gestalten, AGBs und Impressum integrieren und vieles mehr. Im Ergebniss werden Sie erlernt haben, wie Sie innerhalb weniger Stunden einen verkaufsfähigen Online-Shop mit VirtueMart einrichten und im Geschäftsalltag erfolgreich verwalten können. VirtueMart Brasil non-official community and support. This application basicly allow you import products from excel to a virtuemart online store. This product is compatible with Virtuemart 2.0.18 or above. Virtuemart.se is a swedish website that collects news and country related downloads for the Virtuemart eCommerce platform.